I’ve listed my supplies at the end of the post, and for more tips about creating gelli books check Tips & Supplies for Gelli Books. 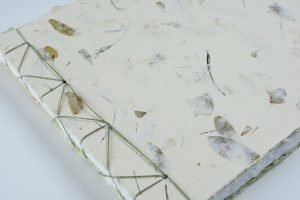 You don’t have to use a gelli print for this book, you could use scrapbook or handmade paper instead. This is book number 14 in my 50 Book Project and I was inspired the sewn chains binding in Keith Smith’s 1-2-&3 Section Sewings. Here’s the video – if it doesn’t display on your screen, click here to view it on YouTube. If you don’t want to miss any more videos or tutorials, please sign up for my weekly newsletter. I’m so happy you have taken the time to make this video. It was great, and I hope it taking so long won’t stop you doing more. I love to learn by watching, and you were so clear with your instructions, you make it seem very easy. I can’t wait to be able to make some of these notebooks, but it will be a while. I have a broken arm, now out of its cast, but sadly, in need of a lot of physio and time before I get back full use of it. 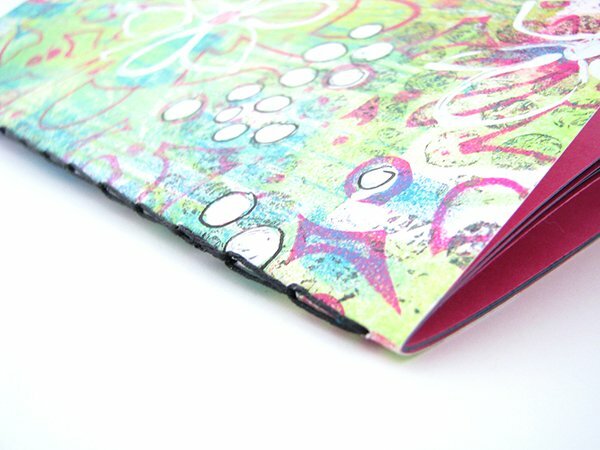 The thought of being able to make these and your other gelli print notebooks is a great spur to push for recovery fast. And your gelli prints are gorgeous. As a bookmaker I look forward to your tutorials. They are easy to follow and visually well done. Thanks. What a lovely book, and a great way to utilize Gelli prints. I am aware how steep the learning curve is to produce videos, and applaud your successful effort! Hello–I have a question about the measuring part of your hole punching template. Is it a repeating pattern, using those three increments, or are the measurements you show and talk about just at the top of the spine, and then the spacing should be just 1/2″ between holes? Hi, yes that makes sense and it’s a great question! The 1/8″ and1/4″ holes are at the top only and then the rest of the holes are 1/2″ apart for the rest of the spine. Hope that helps! Hi Ali! I am actually going to finally try to make some books. It’s been on my want to do list for years. Always inspired by you. This was a well done video.